This Wednesday, 3/28, at 6:30 pm in Crawford 169 is the sixth Cinematheque screening of the semester. Jess FitzPatrick (Ph.D. student, literature) will present Who Framed Roger Rabbit (1988), the fifth in our ‘Anthropomorphism‘ series. 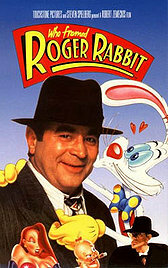 Director Robert Zemeckis seamlessly mixes live action with animation wizardry in this cinematic groundbreaker featuring Bob Hoskins as gruff gumshoe Eddie Valiant, who agrees to take the case of Roger Rabbit, a zany cartoon star framed for murder. But when blackmail and adultery come into play, Eddie discovers that his investigation is hardly kid stuff.